Two novel collection methods using slab gels and glass microspheres have been successfully established for studying cementing processes occurring in the barnacle. These experimental techniques effectively sampled materials in the cement interface where previous collection methods failed to access without compromising enzyme activity. Colorimetric assays on this adhesive detected evidence that polyphenol oxidase (PPO) activities – laccase and Tyrosinase – were present and localized in the adhesion interface. Traditional native PAGE gels were also conducted on the main body organs of the barnacle and showed no presence of these PPOs. The combined results from these observations possibly provides crucial clues for understanding the glue mechanism of the barnacle, directing further research on the role of PPOs in barnacle cross linking. Biofouling in the marine environment occurs when biological organisms adhere to various surfaces, creating deleterious effects. The aggregation of these foulants causes increased drag and textured exteriors, becoming especially problematic regarding the efficiency of navy vessels at sea. Usually covered in algae and barnacles (Bixler & Bhushan, 2012), the buildup of biofoulants decreases the power from 16%-86%, increases drag by , and costs $60 billion annually to combat biofouling in the marine shipping industry alone (Green, 2014; Shultz, Bendick, Holm, & Hertel, 2011). Among the macroscopic foulers, barnacles are known as the most persistent and problematic (Khandeparker & Anil, 2007). Found all over the world in various shapes, forms, and sizes, barnacles have been an ongoing problem since the introduction of the first marine ship. Like mussels and sand castle tubeworms, these arthropods attach to surfaces by secreting cement underwater. Mostly protein-rich, this glue is a low viscous fluid that cures or hardens over time (Power et al., 2010). Despite 150 years of barnacle research, little is known about the adhesion process or even the components of the glue, and adhering hypotheses are still highly controversial. Barnacle cement is one of the most powerful natural glues known to man, with 5,000 lbs. per square inch of tensile strength (Cleere, 2001) and an adhesive layer just a few microns thick (Thomopoulos, Birman, & Genin, 2013). This makes isolating and sampling the glue extremely difficult, and as a consequence, the composition of barnacle cement and the deposition process at the substrate interface are unknown. One of the leading hypotheses in the field, is the cross linking of highly hydrophobic proteins with disulfide bonds, indicated by cysteine residues found in the barnacle cement (Naldrett, 1993; Cheung, Ruggieri, & Nigrelli, 1977). Although this would explain how the proteins in the cement are insoluble, a survey of cement composition in different barnacle species revealed little to no cysteine (Naldrett, 1993). Another widely disputed hypothesis that is investigated in this paper is the use of a polyphenol oxidase (PPO) cascade for quinone-type cross linking. This type of adhesion mechanism binds proteins/phenols via quinone-amine bonds (Crisp, 1972), and is similar to the process that causes hardening of arthropod cuticle after molting (Power et al. 2010). Primarily found in this “shedding” is L-DOPA, one of the precursor molecules for melanization. This chemical plays a significant role in underwater adhesion for other marine organisms, and is thought to be used in barnacle cement. Recently, a specific type of PPO, Tyrosinase, was discovered in the secretory cells of Sabellariidae (tubeworm) adhesives which is highly similar in function to peptidyl-DOPA in cross-linking proteins (Wang & Stewart, 2013). Therefore it was inferred that this PPO might have a role in the cementing process in barnacles. However, it was also reported that no concrete evidence of intermolecular cross-linking or polymerization for the barnacle has been found, and previous analysis of the cement has indicated the absence of DOPA (B. crenaturs, Naldrett 1993; M. rosa, Kamino et al. 1996; Kamino, 2013). Nevertheless, preliminary evidence for polyphenol oxidase activity was observed at the barnacle-substrate interface (advisor, personal communication). Polyphenol oxidases are a part of a larger class known as phenolases, which are copper containing enzymes found in many plants, fungi, and microorganisms that catalyze the oxidation of phenols (compounds with hydroxyl groups attached to a benzene ring) (Logan, 2003). Subgroups of this class of enzymes include catechol oxidases, laccases, monophenol oxidase, or monophenol monoxygenases (tyrosinase, polyphenol oxidase) which are all named for specific substrates they oxidize (Rescigno et al., 1997). By placing a phenolase (catecholase) in a solution with its particular catechol (substrate), the substrates are oxidized to form a quinone, causing a color change from PPO activity. Therefore, a colorimetric means for detecting activity has been established. Generally, colorimetric activity assays are performed in microplates or solely measured qualitatively on proteins separated using gel electrophoresis. However, to test for the enzyme activity at the cement interface of a barnacle, two novel approaches were engineered and adopted in this research. Adult barnacles were transferred and grown on either beds of glass microspheres or on polyacrylamide gel slabs. Following growth after several days, the microspheres and the polyacrylamide gels were assayed for PPO activity, compared and validated. Before sample experimentation, three commercially available enzymes, Laccase from Rhus Vernicifera (L2157-10KU), Horse Radish Peroxidase (HRP) (Lot No. 090503), and Tyrosinase from mushroom (T3824-50KU) were tested for activity with SIGMA-ALDRICH’s enzyme assay protocols [Laccase (EC 1.10.3.2), Tyrosinase (EC 1.14.18.1), and Polyphenol Oxidase (EC 1.13.18.1)]. 4-amino-N,N-diethylaniline sulphate, 4-tert-butyl-catechol, and hydrogen peroxide were also purchased from Sigma Aldrich, Inc. and used for all activity assays. The enzyme concentration was determined by roughly dissolving small spatula amounts of laccase and Tyrosinase into 200 µL of Phosphate Buffered Saline (PBS) pH 7.4, then using a Nano Drop Spectrophotometer 2000 (Thermo Fisher Scientific Inc.) to obtain the precise protein concentration. This was also done with the HRP stock solution. The laccase, Tyrosinase, and HRP yielded concentrations of 1.115 µg/µL, 0.465 µg/µL, and 19.799 µg/µL, respectively. The barnacles (Balanus amphitrite) were settled onto silicone film coated glass panels and raised as described in Holm et al. (Holm, Orihuela, Kavanagh, & Rittschof, 2005). They were then shipped to the research facility, and submerged in 32 parts per thousands (ppt) artificial sea water (Instant Ocean Aquarium Sea Salt Mixture, Instant Ocean, Blacksburg, VA). The barnacles were placed in room temperature with water changes twice a week, exposed to sufficient levels of synthetic visible light, and fed with nauplii of Artemia (Burden et al., 2014). To locate enzymatic activity, different parts of the barnacles were selected and harvested. Barnacle bodies and sub mantle tissue were harvested via needle point tweezers under a dissecting microscope in 100 µL of Phosphate Buffered Saline (PBS) pH 6.5 solution. To ensure no denaturation of protein and enzymes, a 1 mL homogenizer (glass mortar and pestle) was used and the system was placed in a container of crushed ice during “grinding.” After the samples were homogenized, the mixture was pipetted into centrifugal filter units (Amicon Ultra – 0.5 mL) and centrifuged for 30 minutes at 14,000 x g to concentrate the proteins. The condensed sample mixture was then directly loaded onto a native PAGE gel. Figure 1. Conceptual drawing of the anatomy of the barnacle, Balanus amphitrite. Around the perimeter of the barnacle, long longitudinal canals filled with lipid vesicles are lodged underneath calcified shell (see Figure 1). After being “cleaned” out (anything inside barnacles extracted), it was placed in 0.1M Ethylenediaminetetraacetic acid (EDTA) for 12-24 hours to break down the outer shell. Needle nose tweezers were used to extract the canal tissues under a dissection microscope, and immersed in 200 µL of PBS solution. The same method of grinding and concentrating the sub mantle and body tissues were applied for the canal samples. The resulting proteins and lipids were immediately loaded onto a native PAGE gel for maximum activity. Because both Tyrosinase (PPO) and laccase are phenolases, the same phenols can potentially be oxidized in the presence of both enzymes, making the distinguishing process unclear. To overcome this problem, a sequential step-wise process made specifically for a PAGE gel was implemented as described by Rescigno et al. (Rescigno et al., 1997). 4-amino-N,N-diethylaniline sulphate (ADA) and 4-tert-butyl-catechol (tBC) were used to assay for laccase and Tyrosinase, respectively, while the combination of ADA and hydrogen peroxide detected peroxidase. ADA is specific to laccase only, hydrogen peroxide is specific to peroxidase only (ADA is the color indicator), and tBC is a substrate for all three enzymes. Table 1. Colors of the different combinations of substrates. The ADA column is step 1, ADA + H2O2 is step 2, and ADA + H2O2 + tBC is the third step of Rescigno et al.s colorimetric assay. After each assay stain, the system was subjected to a 100mM potassium phosphate buffer pH 6.5 wash to stop further reaction. Because the color from each exposure still remained after “washing”, the process of elimination was incorporated (see Table 1). For example, if laccase was present and the gel was stained with ADA, a pink byproduct would be emitted, therefore indicating laccase activity. In the second step, when hydrogen peroxide was added, the lane that showed a brighter pink should contain peroxidase. Because laccase was already identified before the second step, peroxidase could also be identified. Note that this process would cause ambiguity when assaying enzyme mixtures, as will be discussed in the Results section. At first, activity assays on sodium dodecyl sulfate polyacrylamide gel electrophoresis (SDS-PAGE) gels were run based on literatures that reported that SDS (detergent) enhanced enzymatic activity (Zaidi, Ali & Ali, 2014; Castro-Sowinski, Martinez-Drets, & Okon, 2002). However, contrary to their results, we observed no activity bands, possibly denatured by the SDS and preheating of the samples. Therefore non-denaturing gel electrophoresis (native PAGE) gels were used instead in this paper. A native PAGE system was carried out on Mini-Protean TGX pre-made gels (Bio-Rad). Samples from different parts of the barnacles were used: Barnacle body lysate, sac lysate, and sub mantle lysate. 15 µL of each sample were mixed with 15 µL of the Native Sample Buffer (0.5 Tris pH 6.8, 50% v/v glycerol and 0.05% bromophenol blue), then half of the total mixture was extracted and placed in separate wells of the gel. For the positive controls, 10 µg of the enzyme was found to be optimal, therefore 8.97 µL of Laccase, 21.505 µL of Tyrosinase, and 0.505 µL of HRP were placed in separate wells in combination with the Native Sample Buffer. For 1 hour, 200 DC volts were applied to the gel while an ice coolant was placed in the Tris Glycine with no SDS (running buffer) in order to avoid overheating the system. The electrical polarity was also flipped to examine the possibility of any protein bands with a higher pI than the buffer. It was found that all sample lysates had a lower pI compared to the buffer, therefore, in further trials the polarity was not switched. After electrophoresis, Rescigno et al.’s activity assay method described in Section 2.4 was applied. Lastly, a Coomassie stain was performed to the assayed gel in order to visualize the separated molecular bands. Polyacrylamide gels of varying percentages were casted, all ~ 3 cm in height. After solidification and 4 repeated washes with deionized water, 3 barnacles were placed on the gel surfaces and grown for three weeks. After checking for barnacle adherence, activity assays were performed on all samples using Rescigno et al.’s activity assay method (refer to Section 2.4), with minor adaptations: longer periods of substrate staining. Because these gels were much thicker and bigger than the MINI-protean gels, ADA was subjected to laccase for 15 – 20 minutes, ADA + H2O2 soaking was given 15 seconds, and ADA + H2O2 + tBC was tested in increments from 1 hour to overnight. Prior to staining, each gel was injected with laccase, HRP, and Tyrosinase via syringe. A bed of glass beads were lain underneath a barnacle to harvest the cement. After one week, these granules were scraped off the underside with a metal blade. The collected samples were then rinsed three times with deionized water and stored in 4° C for use. This approach allowed testing with a colorimetric assay using Micro test tissue culture 96 well flat bottom plates. Then, the same activity assay was applied. 20 µL of collected microsphere granules were pipetted into separate wells of the Micro plate, refer to Table 2 (Row A Columns 1-7, 10, 11). 100 µL of each substrate solution were used depending on which enzyme was assayed for (Rows B, C, and D). To test for the positive controls, 5 µL of each enzyme was placed into separate wells with the corresponding substrates (Columns 8 and 9). Column 1 served as background when compared with column 2 (ADA contains HCl, hydrogen peroxide contained deionized water, tBC contains Acetic Acid). In columns 3 and 4, the same concept was applied in a reverse order of substrate solution. This was tested as additional controls due to a different report suggesting the order portrayed different colors (Rescigno et al., 1996). Columns 5, 6, and 7 were individual substrates exposed to the beads, instead of through a sequential order like in columns 1 – 4. All wells were “rinsed” with potassium phosphate buffer (PPB) between substrate washes except column 11, which investigated the enzyme activity signatures with and without the PPB. Table 2. Overview of 96 well plate. X indicates no solution, and the term wash represents the solution that had reacted with the beads and given substrate. For instance, when ADA was added to A2, the solution was taken and placed in B2, all the while leaving the beads behind. The native PAGE analyzed three major body parts of the barnacle: sub mantle tissue, longitudinal canals, and the main body (see Figure 2). A colorimetric assay was performed on the separated components and exhibited an absence of polyphenol oxidases from all samples (refer to Figure 2a, b, and c). Peroxidase activity was detected as a bright pink band in lane 5 only in the barnacle body lysate (Figure 2b). The three controls, laccase (lane 7), peroxidase (lane 8), and Tyrosinase (lane 9) each turned their corresponding colors given the different substrate soaks (ADA, Peroxide, and tBC, respectively). It should be noted that sampling pure cement has not been successful with the PAGE method due to its harsh degradation process. Distinct temporal changes unique to each positive control were also observed. When first subjected to a substrate stain, the colors for each enzyme reached its peak color intensity, then either receded in strength or stayed constant with time. The laccase activity tended to disappear quickly after the ADA exposure, becoming fainter in color throughout each step of the assay. In the second step (addition of peroxide), the peroxidase enzyme did not lose its intensity, remaining a bright pink color throughout all substrate washes. As for the Tyrosinase enzyme, a mediocre blue coloring appeared in the third step, varying from faint to decent color payoff. The other two enzymes also turned blue with the tBC addition. Applying the Coomassie stain (see Figure 2d) after the last step of Rescigno et al.’s colorimetric assay, molecular bands for laccase were absent, suggesting the enzyme was continuously degrading. Heterogeneous mixtures, as opposed to separated components, were assayed for barnacles grown on glass microspheres and slab gels. This significantly changed the experimental conditions, making Rescigno et al.’s colorimetric assay ambiguous in identifying laccase, peroxidase, and Tyrosinase. Therefore, these temporal responses found in the native PAGE were taken into account for the approaches in order to address the uncertainty for proper detection of the enzymes being tested for. Different porosities of gels were tested to find the optimal polyacrylamide concentration for barnacle attachment. 2% polyacrylamide gels were too gelatinous for the barnacles to adhere to and often immersed itself inside the gel. In the 15% gel, the barnacles barely attached, and while performing the assay soaks, 2 of the 3 barnacles detached from the surface. This indicates that not enough substance is secreted into the gel, and thus no optimal surface to attach to. The 4% gels were found to possess the best conditions for subsequent growth and adhesion. Figure 3. Laccase assay, the first step of Rescigno et al.’s colorimetric assay on the 4% polyacrylamide gel. Bottom view of the gel, and the barnacle is shown as the pink circular object near the center of the picture. The four circles represent positive and negative control injections. The 3 cm hand casted 4% polyacrylamide gels enabled effective cement analysis without denaturing or altering the cement interface. When assayed for laccase activity using ADA substrate, a strong pink color formed around and under the leading edge (outer rim) of the barnacle, i.e. in a ring shape (see Figure 3). When observed for a prolonged period of time (longer than the entire duration of all steps), the pink byproduct often diffused to the center of the cement plaque, however, it was still dimmer in color compared to where it first originated, at the leading edge. After ~ 12 – 14 hours of only the ADA stain, the gel contained a high pink background throughout the whole material. Figure 4. 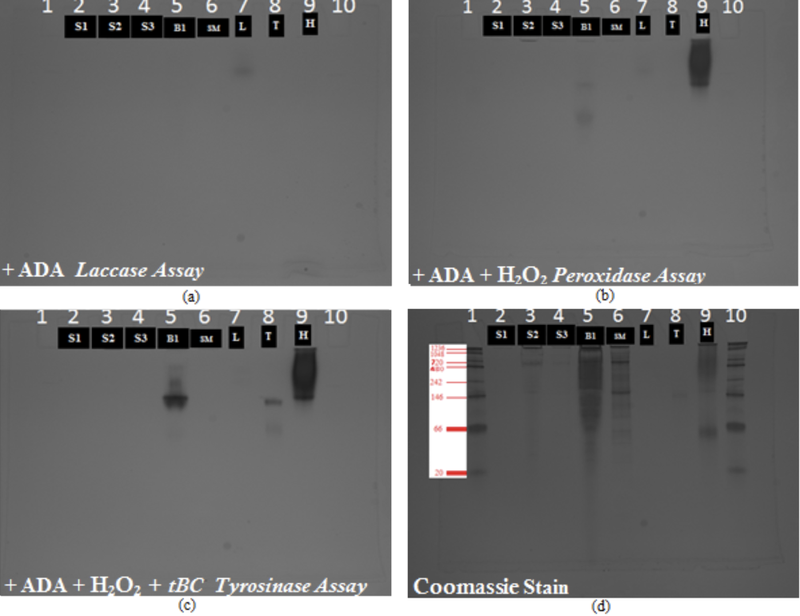 Peroxidase assay, the second step of Rescigno et al.’s colorimetric assay on the 4% polyacrylamide gel. In the bottom view the barnacle is shown as the bright pink circular object. There are four positive and negative control injections. A more intense pink color was observed when exposed to hydrogen peroxide, signifying the peroxidase activity (see Figure 4). Although similar in appearance to the ADA stain because the color intensity change occurred in 12-15 seconds (much faster than 20-30 minutes for laccase), peroxidase activity was clearly identified. Spatially, the bright pink color from peroxidase was detected closer to the center of the barnacle in the similar ring like signature of laccase. Figure 5. Tyrosinase assay, the third step of Rescigno et al.’s colorimetric assay on the 4% polyacrylamide gel. Bottom view of the gel, and the barnacle is shown as the blue circular object at the left. There are four positive and negative control injections. B1 is the side view of the barnacle. In contrast, a blue “bowl” shape underneath the barnacle was consistently detected during tBC addition in the 4% gel, thus indicating activity of the PPO, Tyrosinase (refer to Figure 5). Note that because this approach could assay a heterogeneous bulk mixture, the blue color may have also indicated laccase or peroxidase activity. In the previous two steps, however, laccase and peroxidase were identified near the leading edge, whereas in the center the color remained unchanged. When subjected to the tBC stain, both the center and the outer rim emitted a blue hue, indicating a likelihood of Tyrosinase activity at the center of the cement interface. Figure 6. Glass microspheres covered in fibrous cement proteins. (a) Cluster of multiple beads glued together by the cement. (b) Two beads connected by cement. Scale bars ~ 250 μm. This approach attempts to assay the cement, expecting the proteinaceous glue molecules to cluster the microspheres (See Figure 6). This method was independent of and parallel to that of the gel substrates described in Section 3.2, serving as another means to analyze the cement interface of the barnacle. The colorimetric assay was also adopted to analyze enzyme activities. The positive controls confirmed Rescigno’s method. Figure 7. Microsphere assay. Table is a depiction of what was inserted into the wells. Row A is filled with the cemented microspheres. Each substrate solution, stated in the table, was injected in row A, than extracted and placed in row B. B2 and B5 showed laccase activity, and B6 showed peroxidase activity. Laccase activity was observed when the cured microspheres were saturated in the ADA substrate, as seen in B2 and B5 (see Figure 7). Peroxidase activity was also detected with the addition of hydrogen peroxide, changing to an intense pink almost red color pictured in B6. Figure 8. Microsphere assay specifically for Tyrosinase activity. L-tyrosine was used as a substrate. A1 (control) shows Tyrosinase activity with tyrosine. A2 (sample) depicts no activity when microsphere balls covered with cement and L-tyrosine was mixed. As mentioned in Section 3.1, Tyrosinase cannot be uniquely detected due to the presence of laccase and peroxidase. To address this ambiguity, a list of common substrates for the three enzymes were compiled. It was found that L-Tyrosine was specific to the PPO, Tyrosinase, producing a brown-orange color. A preliminary experiment using this substrate was tried on the glass microspheres, resulting in no visible Tyrosinase activity. The positive control was also prepared with a high enzyme concentration, however, the resulting color was very weak as shown in Figure 8, bringing the possibility that the Tyrosinase concentration in the sample might be too low to be detected by this method. A more sensitive color detection, such as spectrophotometry, could be implemented in the future to address this issue. PPOs are often found in organisms responsible for a variety of functions such as melanization, sclerotization, and molting (Klowden, 2013). As the barnacle molts, concentric rings or ecdysal lines (Darwin, 1854) grow radially outwards, expanding from old cuticle to new near the base plate (see Figure 1). Beneath this hardened cuticular tissue, layers of protein-containing chemistries are secreted and therefore, forms the adhering interface of the barnacle (Burden et al. 2014). Because these two phenomena, molting and adhering, occur simultaneously at the substrate interface, it would be difficult to identify from which the enzymatic activities originated. However, since the native PAGE results showed no PPO activity in main molting organs, i.e. the main body, it was determined that the observed laccase and Tyrosinase activity with the slab gel and microsphere techniques should be from the cementing process only, assuming that a detectable concentration of the enzymes was collected. As previously mentioned, PPO activities were identified at the cement interface with distinct spatial distributions. Laccase was observed in a pink ring-like signature at the leading edge (outer rim) of the barnacle, where pre-cement material was secreted and hardened into robust adhesive. This implies that laccase-like activity was acting as a precursor to the cementing process (Klowden, 2013) or directly functioning to cross link proteins into fibrils that make up the barnacle cement. Also, because no change in color was detected at the central region of the barnacle (cured cement), it is suggested that the enzyme degraded after completing its function. In contrast, the blue hue after tBC addition showed uniform distribution underneath the barnacle. This indicates that, within the time scale of this experiment, Tyrosinase did not degrade after the cement cured. Previously, to access the cement interface, harsh collecting processes inevitably denatured the enzymes, mauling their activities (Kamino, Odo, & Maruyama, 1996). The two novel methods used in this paper allowed effective cement analysis on unaltered proteins for the first time in the barnacle research community. The slab gel method was proposed by a mentor in the current research facility and demonstrated the capability of detecting PPO activities with spatial resolution in the barnacle cement without any collection process. On the other hand, the microspheres’ was introduced by Wang & Stewart in 2013 for tubeworm adhesives (Wang & Stewart, 2013), and successfully adopted for barnacle research in the current work. It is believed that these two techniques would lead a range of new experiments for understanding the adhesion mechanism of the barnacle. The hypothesis in this paper regarding quinone type cross linking with PPOs (see Introduction) was made observing other marine organisms, i.e. tubeworms and mussels, as mentioned in the Introduction Section. However, direct investigation of the cement interface remained problematic, due to the difficulty in sampling. In this paper, laccase and Tyrosinase activity was observed with the slab gel and microsphere techniques while the native PAGE results showed no PPO activity in main molting organs. Taken together these observations indicate a significant level of PPO activity that appears to be localized at the barnacle-substrate interface, possibly providing an important clue into the barnacle cementing process. In order to fully support this hypothesis, further assay development is necessary to build upon these preliminary results and determine the role of PPO activity at the interface. Two methods, gel slabs and microspheres, were successfully implemented to study enzymatic activity at the cement interface. These collection techniques allowed effective sampling of native enzymes, keeping them in their non-denatured states, and as a result, identification of PPO activity in the barnacle, Balanus amphitrite, became possible. In this experiment it was observed that laccase and Tyrosinase activity was confined in the cement interface underneath the barnacle, directing further research on polyphenol oxidase’s roles in the barnacle’s adhesion mechanism. Future research should include inhibitor incorporated assays. For example, CTAB, SHAM, and PTU can be used to suppress enzymatic activities of laccases, polyphenol oxidases, and catechol oxidases (Wang & Stewart, 2013). By monitoring their effects on cement formation, it is expected to narrow down the enzymes found in the thin adhesive layer as well as identify which enzyme is specifically at the leading edge of the barnacle on the slab gels. In addition, this method may provide a possible practical application, i.e. mitigation technique of barnacle adhesion. Burden, D. K., Spillman, C. M., Everett, R. K., Barlow, D. E., Orhiuela, B., Deschamps, J. R., . . . Wahl, K. J. (2014). Growth and development of the barnacle Amphibalanus amphitrite: time and spatially resolved structure and chemistry of the base plate. Biofouling, 30(7), 799-812. http://dx.doi.org/10.1080/08927014.2014.930736. Klowden, M. J. (2013). Physiological systems in insects (3rd ed.). San Diego, CA: Elsevier.